Bounty Bay is dominated by a rocky outcrop known as Ship Landing Point. Its name serves a dual purpose being the point overlooking the HMAV Bounty’s resting place and the point where vessels head for when approaching the relative shelter of Bounty Bay. The Pitcairn Islands Tourism web site describes the point as being "approximately 1100 feet high and can be seen from about 25-30 miles away on a yacht - visibility and swell allowing. Approaching from the East, Pitcairn Island appears to have a saddle in the middle of it. This is where you should initially aim for. As you near the island, toward Bounty Bay there appears to be a distinctive pinnacle, high above the bay - again head toward this pinnacle". This visible landmark has at its highest point, a rather precarious rock known as "The Nose". Its future is uncertain as it is fracturing and slowly parting from the cliff. For a first-hand experience try this You Tube adventure with the stamps photographer Tony Probst.‎ Make sure you turn your sound on! Ship Landing Point has been described as "possessing considerable beauty". It rises in bold outline almost perpendicularly from the sea, its rugged, rocky front softened here and there by patches of grass and shrubs. For those who make the difficult climb the views of Adamstown and the Pacific are magnificent. 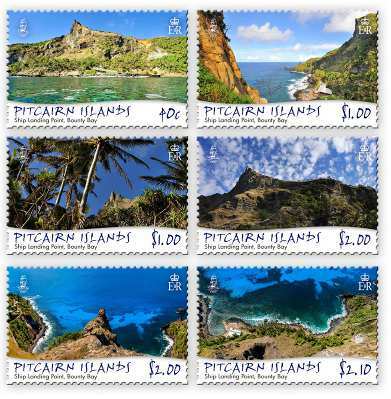 As part of the scenery series on Pitcairn, this stamp issues shows the rugged beauty of Bounty bay and its surrounds. 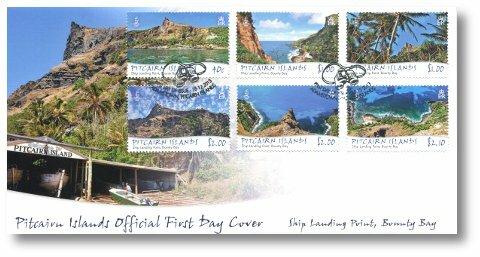 Ship Landing Point is a stand out symbol and a feature of Pitcairn Island’s geographical landscape. The Philatelic Bureau is indebted to Tony for his valuable assistance in making this issue possible.